Appearing now as the fifth and final issue in the Perth Mint of Australia’s Doctor Who Monsters series is the 2014 Sontarans 1/2 oz Silver Proof Coin. This coin is struck from one-half ounce of .999 fine silver with a mintage limited to 5,000. Shown on the coin’s reverse is a colored design depicting one of Doctor Who’s most sinister adversaries, the Sontarans. 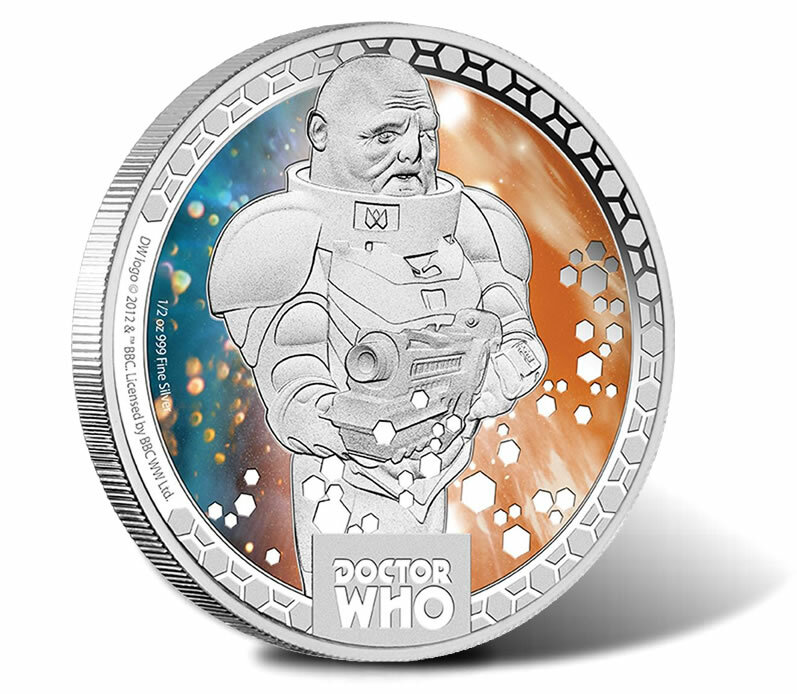 "The fifth and final coin in the Doctor Who Monsters series features the Sontarans, an aggressive clone-warrior race from Sontar," the coin’s product page describes on the Perth Mint’s website. "Known for their stocky build, greenish brown skin, and distinctive dome-shaped head, the Sontarans reproduce by cloning." Doctor Who is a television show produced in Great Britain by the BBC. It chronicles the adventures of a time-traveling hero who boards his ship, the TARDIS, to foil the plans of his enemies. One of those foes is the Sontarans who tried to invade Earth in the 13th century only to be stopped by the Doctor. Later attempts were also thwarted through the intelligence of Doctor Who. Reverses offer a detailed and colored background contrasted against a Sontaran. Inscriptions include DOCTOR WHO, 1/2 oz 999 SILVER, and DW logo © 2012 & ™ BBC. Licensed by BBC WW Ltd. Shown on the coin’s obverse is the Ian Rank-Broadley portrait of Queen Elizabeth II. Inscriptions surrounding the royal portrait read: NIUE, ONE DOLLAR, ELIZABETH II and 2014. Each coin is struck under official license of BBC Australia & New Zealand and issued by New Zealand Mint. They are produced as legal tender of the island nation of Niue and have a face value of TUV $1. Coins are housed in a classic Perth Mint display case which ships inside an illustrated shipper. The shipper offers a colored image of a Sontaran. A numbered certificate of authenticity is also included.